I went to a Steampunk gathering at Lincoln this weekend. 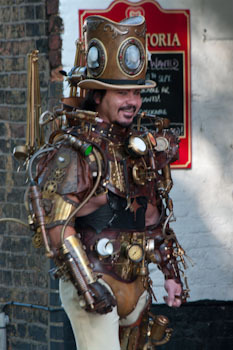 I’d heard a bit about steampunk and knew it was a visually interesting dress style, but wasn’t expecting to see quite such incredible characters and costumes. After talking to a few of the “fans” I soon learned that steampunk is based on the fictional era depicted by Jules Verne and HG Wells. Half science fiction, half fantasy steampunk takes elements of British Victorian fashion, culture and architecture and merges it into a visual feast. Expect to see modern items redressed to give a period feel of neo-Victorianism. Fans make weird and wonderful looking contraptions, and wear brass goggles often with flick over magnifying lenses. Gadgets that would feel at home in Wilf Makepeace Lunn’s house are common sites, many attached to clothing to give added three dimension. The Steampunks of the modern era make all their own costumes and none seem quite so spectacular as Liam Brandon Murray, who you’re likely to see at the Whitby Goth Festival too. His costumes are forever changing as new items are added to the base shell. An outfit of leather brass and copper, merged with clock dials, pipes and furnishing makes for fascinating viewing. You can see several of his creations on DeviantArt here: SteampunkOverlord.